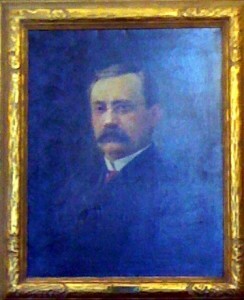 The Honorable Levi M. Vilas was born in Vermont in 1841 and moved with his family to Madison, Wisconsin at the age of 10. He graduated from the University of Wisconsin and was admitted to practice in both Wisconsin and New York a year later. After going back and forth between the two states, he set out into frontier territory, while later staying in Saint Paul. Vilas finally settled in Eau Claire, Wisconsin. He was the community’s first City Attorney and served three terms as Mayor. Interestingly, one of the Second Judicial District’s earliest judges, Vilas declined appointments to the Wisconsin Supreme Court on two occasions. Vilas married Lizzie Stewart Ludlow in 1885. Two years later they moved to Saint Paul, laying roots at 409 Ashland Avenue. Judge Vilas was appointed to the bench by Governor Merriam. The Law Library has on display judicial portraits of past Second Judicial District Court judges, going back to 1857. If you have any information or commentary about Judge Wilkin, please leave a response or send us an e-mail. To view the portraits in person, visit us on the 18th floor of the Ramsey County Courthouse.